Greater Boston’s suburban office and lab market encompasses over 125 million square feet and consists of eight major submarkets concentrated along Route 128 and Interstate 495. 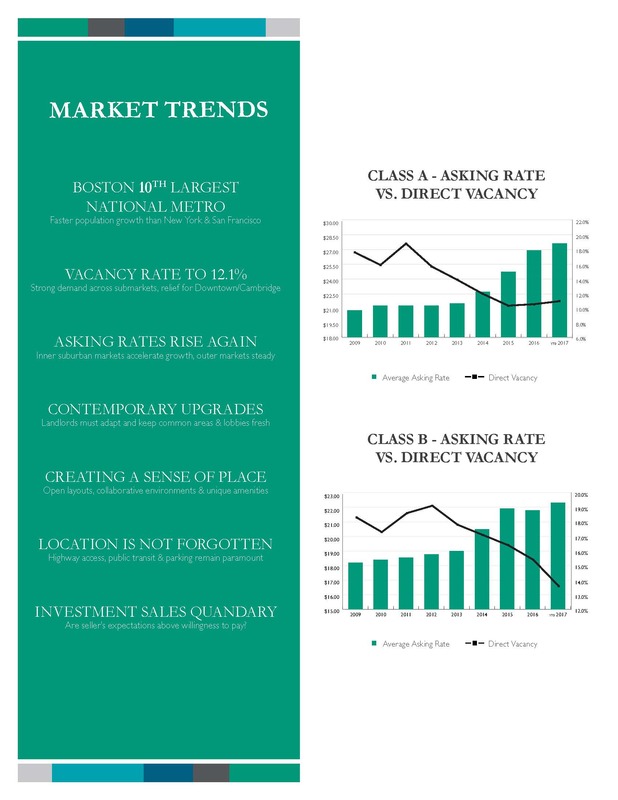 Immense pressure across the Boston and Cambridge markets has caused tenants to consider suburban locations for rent relief and future growth opportunities. With Cambridge having near zero availability and lab space in the area being so expensive, many life science companies are also looking towards the suburbs to find accommodating lab space. More established suburban lab markets such as Lexington and Waltham are thriving while relative new comers such as Watertown, Bedford, and Framingham are being revitalized by strong tenant demand. The Route 128 submarket kicked off 2019 with a busy start. BAE Systems signed an extension for 135,000 square feet at The District in Burlington, SQZ Biotech signed a lease for 63,000 square feet at Arsenal Yards in Watertown, Dicerna Pharmaceuticals signed a lease for 80,000 square feet at 33 Hayden Avenue in Lexington, and Stantec signed a lease for 47,000 square feet at 65 Network Drive in Burlington. Interesting to note the number of life science tenants moving into the Route 128 market to start off 2019. With extremely limited space in Cambridge, tenants are being forced to seek new options and most are heading north and west along Route 128. Adding to the strong start in 2019, two large corporate tenants established new corporate headquarters in the Route 128 submarket. Waltham-based ZoomInfo, the sales and marketing platform, opened its new 73,000 square foot headquarters at 170 Tracer Lane in Waltham. Puma signed a long-term lease for 150,000 square feet at Assembly Row in Somerville. When the new building opens in 2021, Puma will consolidate employees from its current Downtown Boston offices and suburban Westford location. Most recently, Amazon’s Alexa business unit announced it will lease 50,000 square feet at One Cabot in Medford. The expansion to Medford is a major win for the city and the Rivers Edge neighborhood. Most credit the area’s accessibility to the MBTA Orange Line and clustering of local robotics workforce with Amazon’s strategic decision to push north of the city. Looking forward, strong regional macroeconomic indicators coupled with strengthening regional demographics have the Greater Boston suburban real estate market positioned for future growth, reflected by a very strong beginning to 2019. With Boston’s notably compact size and limited transit network, there is enormous potential for growth within the inner suburban markets. Over the next 12 months, watch as both investors and tenants acknowledge the growing spread between Downtown and suburban pricing/yields and how the market will adjust accordingly.